Manoel Island 20th December 1957. 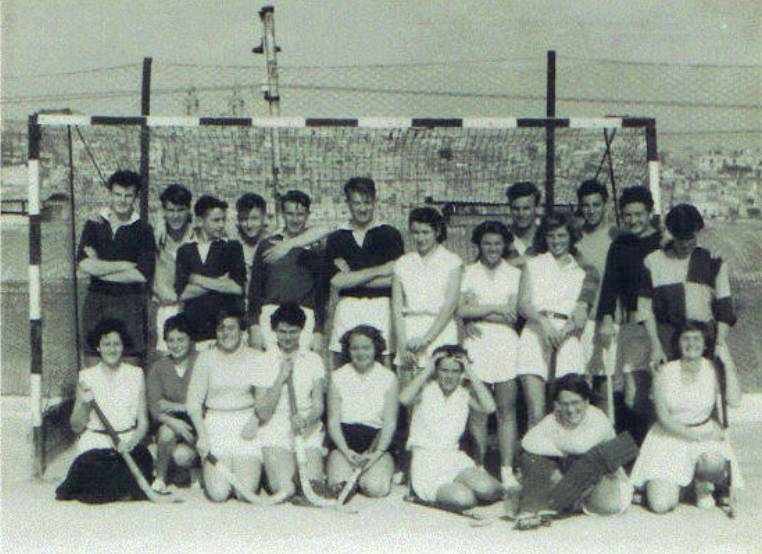 I think this was 6th form boys versus girls hockey match at Manoel Island 20th December 1957. Boys 2 - Girls 1! I have a similar one from 1958 when the boys won 5-0! Boys were (left to right) Roddy Robertson, Gordon Moore, Bob Trott, Jack Stubbs, Craig Love, Roger Chandler, George Whitehouse, Robin Palmer, Stan Hill, Bill McKinnon. Girls wer Marigold Barrett, Janet Ogden, Wendy (S), Joy Sutton, Val Wood, Gillian (Howe? ), Liz Wilkinson, Val Bevins, Jill (S) Nina Waterworth, and Wendy Blanchard.My version of this photo is a mirror image!